Cadmium is a naturally occurring metallic element, one of the components of the earth's crust and present everywhere in our environment. Its presence results mainly from gradual phenomena, such as rock erosion and abrasion, and of singular occurrences such as volcanic eruptions. The element's existence was revealed in 1817 and it owes its name to "cadmia fornacum", the "zinc flowers" which formed on the walls of zinc distillation furnaces. Its industrial applications were developed particularly during the first half of the 20th century, based on its unique chemical and physical properties. Its potential risks to human health have been well studied and are now well controlled. Cadmium emissions into the environment resulting from its use have been continually decreasing since the 1960's. Today these are insignificant and will approach zero in a decade's time, when cadmium products will be almost totally recycled, thereby eliminating any perceived problems. Cadmium is a byproduct of the primary non-ferrous metal industry. Rather than disposing of it as a waste, engineers have been able to utilise its unique properties for many important industrial applications. The most remarkable characteristics of cadmium are its great resistance to corrosion, its low melting-point and excellent electrical conductivity. Cadmium compounds exhibit excellent resistance to chemicals and to high temperatures. Finally, cadmium pigments produce intense colourings such as yellow, orange and red and are well known in artists' colours, plastics, glasses, ceramics and enamels. Cadmium levels in the environment reached a peak in the 1960's. Since then, these levels have been constantly decreasing due to improved technology for the production, use and disposal of cadmium and cadmium-containing products. Industrial emissions are now tightly controlled due to the significant improvement in pollution control technology and to strict regulation and legislation, particularly in the metals industry. The problems of incinerating waste containing cadmium can be solved using existing best available technology to capture more than 99 % of incinerator fume emissions. With regard to end-of-life disposal of products containing cadmium, it should be emphasised that, in many of its applications, cadmium is embedded in a product matrix and hence not directly bioavailable. In the very long term, the limited traces of cadmium eventually released from waste products will transform to a stable chemical form (oxide or sulphide) and so return to the original state found in nature. Cadmium-containing batteries, coatings and alloys are totally recyclable, the techniques have been mastered and existing capacities are available throughout Europe. The costs involved are economically acceptable and hence viable. Increasing recycling of cadmium products using modern technologies will further decrease its dispersion into the environment resulting from human activity. Beginning in the 1950's, the scientific community has drawn its attention to the potential toxicity of cadmium and to the risks presented by its accumulation in man. Cadmium mainly accumulates in one specific organ - the kidney. At high levels it can reach a critical threshold and can lead to serious kidney failure. The most recent studies, however, (Buchet/Bernard, 1998) have shown that these effects are reversible, at least at low exposures, once exposure to cadmium is reduced. The major route for cadmium intake is ingestion (for non-smokers). This is largely due to the presence of trace levels of cadmium in foodstuffs of natural origin or of the use of phosphate fertilisers and sludges on agricultural soils. 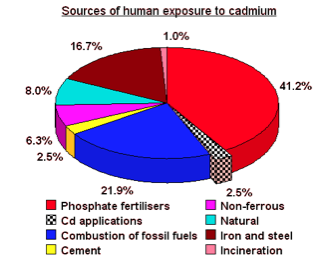 The diagram above presents the relative importance of the various cadmium sources to human exposure. 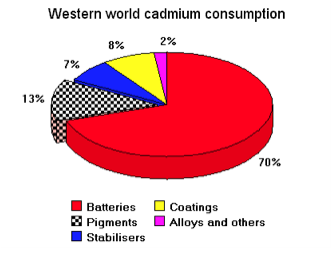 It clearly indicates that the total of all cadmium applications represents a very low proportion, less than 3 %, of the total cadmium sources to human exposure. Investigations conducted around the world show that, for the general population, the average daily cadmium intake from all sources is very low and is at the lower end of the total range of 10 - 25 µg/day. Human exposure has continued to decrease over the past 20 years and is still doing so today. 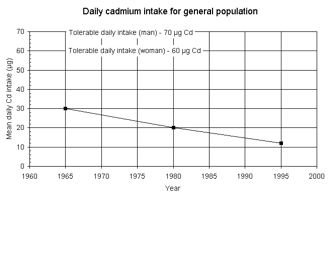 In comparison the tolerable daily cadmium intake established by the WHO is 60 µg/day for women and 70 µg/day for men. In industrial environments, workers could be exposed to cadmium through inhalation. In modern enterprises, workers' exposure to cadmium is controlled by rigorous industrial hygiene practice and continuously monitored by medical tests and follow up, thus preventing any health risks for the workers. The carcinogenic risk of cadmium by inhalation is increasingly being contested by newer studies (Soroha, 1995-97) demonstrating the importance of confounding factor. These batteries are essential in many portable and industrial applications. These include such consumer applications as power tools, personal computers, cellular phones and household appliances etc. for which demand is constantly increasing and industrial uses as in aircraft and railways. They are safe and recyclable and, alongside the development of other battery couples, NiCd batteries continue to provide unique benefits for specific applications. It is thanks to NiCd batteries that the electric car has developed significantly in Europe and that many other types of electric vehicles will continue to be developed in the future. This is simply because nickel-cadmium battery technology offers the best combination of power, energy, cycle life and cost of all existing electric vehicle batteries. The battery industry has committed itself to a pro-active policy directed towards a "zero cadmium input" into the environment. By promoting the collection and recycling of end-of-life products and waste containing cadmium, the European Directives should facilitate these developments. Cadmium pigments are insoluble in water and in organic solvents and have a very good resistance to detergents and the action of most corrosive alkaline chemicals. The most important property of Cd pigments and stabilisers is their heat and ultraviolet light stability. Plastics such as ABS, nylon, fluorocarbons and polycarbonates, and some other thermoplastics, such as polystyrene, polypropylene and high-density polyethylene (HDPE) are processed at temperatures ranging up to 400ºC. Their dispersion, non-migration and non-bleeding properties make cadmium pigments useful in plastic applications where uniform colouring is important. 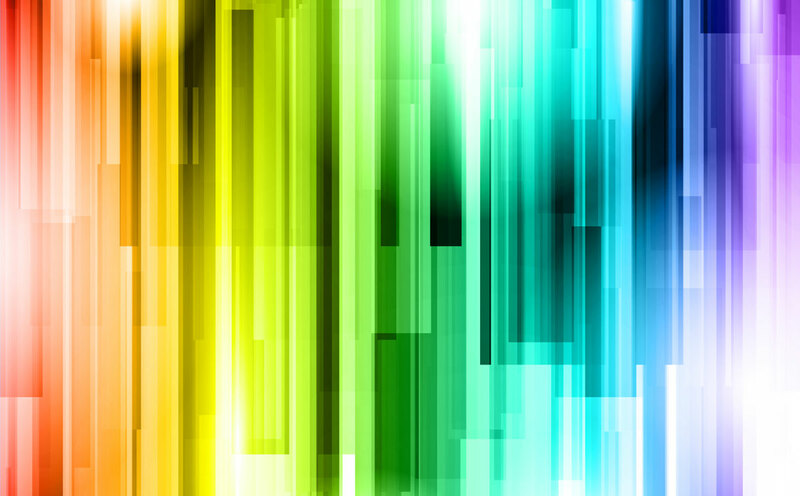 These superior characteristics together with many others make cadmium pigments useful in all plastics applications. Cadmium plating provides outstanding corrosion protection to metallic structures together with low friction coefficients and low electrical resistivity. The combination of these properties along with others such as good brazability and solderability and galvanic compatibility make it the preferred coating when critical or safety-related applications such as fasteners or equipment in the aerospace, electrical, defense, mining, nuclear and off-shore industries.